than the leading filtration brands. Through rigorous testing by independent, EPA-certified laboratory, Envirotek Laboratories, our products have been proven to effectively remove or reduce hundreds of contaminants from water. Compare the ability of Adya's products to any of the leading brands, and you will see why Adya is the manufacturer who provides the most comprehensive solution for water treatment. 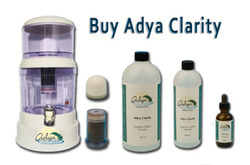 · By cleaning water, Adya's products help clean the air. Certain chemicals, like Volatile Organic Comounds (VOC's), easily evaporate from water and end up in the atmosphere. By reducing these chemicals in water, Adya's products help reduce them in the air as well. · Adya's products help reduce greenhouse gases and landfill waste by eliminating the need for bottled water; so you can get pure, fresh water without all the waste. Talk about refreshing! FDA Labeling Requirements: What regulations have we followed or exceeded? Scroll down to page 29 - Chapter 8 "The Toxic Minerals Belief" Read the entire chapter. The charts for aluminum in foods are on pages 30-32. We have applied for this Official letter and await it's arrival. We will publish the letter ASAP. This report is filled with excellent and useful information regarding the role iron plays in drinking-water, please review it in it's entirety. On page 161 the third paragraph is particularly interesting. It speaks of a study that showed no association between aluminum in drinking-water and Alzheimer disease, however there WAS an association between ORGANIC monomeric aluminum and Alzheimer disease.